Yes darlings, it's true! It seems that book people are often record people too. So I have decided to include a Vinyl Records category on the LaCreeperie website, and see how it goes. After taking an Instagram poll, it seemed people were interested in seeing vinyl on the LaCreeperie website. "Give the people what they want" is one of my mottos, and so a vinyl category was born. 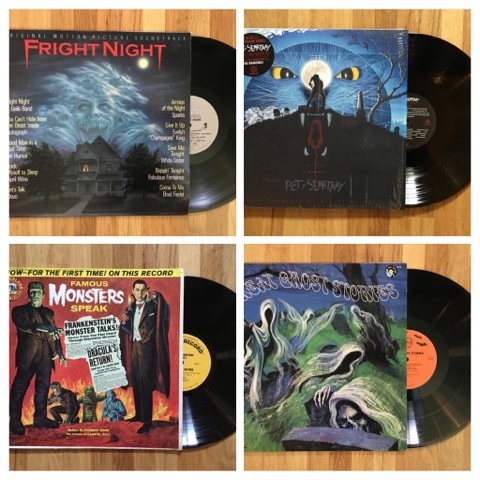 You can expect to see Halloween related records, Horror, SciFi/Fantasy soundtracks, spooky sound effects albums and a few Goth, Punk Rock and Pop Culture titles in the category. My main focus will always be books first, but I am having too much fun adding vinyl to the website. I've given up trying to keep abreast of all the new releases and reissues coming out faster than you can say BOO, but I promise to keep my record hunting skills honed to try to find the titles worthy of your attention. Welcome fellow vinyl junkies, pull up a seat and stay awhile. You never know what treasures I will come across on my quest for delicious and desirable books for you to read, and spooky records for you to listen to. Stay tuned! Since LaCreeperie's inception, it has undergone many, many changes in it's 6 year lifetime. What's that, you say? 6 years?? Yep. 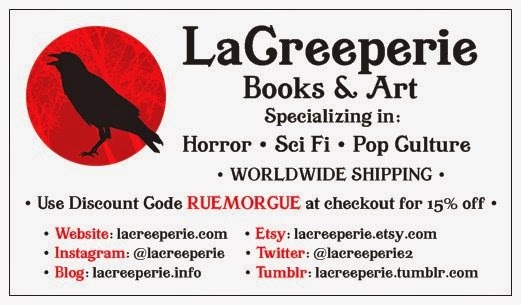 I dreamt up the LaCreeperie name 6 years ago, and immediately opened an Etsy Shop. At that time, I didn't really know what to carry in the shop, I just wanted to lock in the name and figured the rest would come. At first I carried anything Halloween, Horror or Gothic related I could find, within the 20 year-or-older vintage parameter. Then I moved on to children's Halloween books, which did very well and sold out almost faster than I could list them. That's about the time my other shop JustCoolRecords began to skyrocket, and I could no longer afford the time to nurture LaCreeperie. Somewhere after that the shop remained completely empty and sad for more than a year until April 2014, when a new and improved LaCreeperie was born and remains as you see it today. In November 2014, the website was launched, and has come to be the most successful website I have ever created in 13 years of online retailing. I have many loyal followers to thank for this, and I never cease to be amazed at the constant flow of positive feedback it receives. I guess I finally got it right.